Kosher Chef , chosen for its natural purity, is the perfect salt for any occasion! Its crisp and flaky texture is great for absorbing flavors and enhancing any culinary dish! Whether you’re an amateur chef who is passionate about food and loves to cook at home or a professional chef, Kosher Chef is a great staple salt for all culinary enthusiasts alike! No kitchen should be without Kosher Chef Salt! 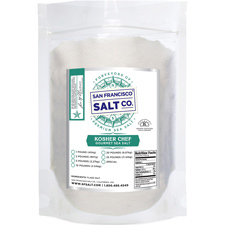 ECONOMICAL AND VERSATILE - Kosher Chef Salt is a budget friendly gourmet salt that is as versatile as it is delicious. 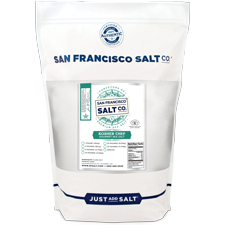 This salt is the perfect choice for every step of the cooking process –– whether that be salting water, seasoning ingredients, or finishing food! A CHEF FAVORITE - Kosher Salt is a popular ingredient in professional chefs’ kitchens because of its mild flavor and unique crunchy, flakey granules. 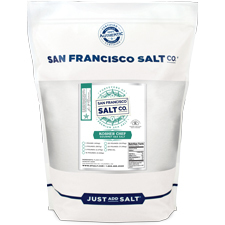 The large irregularly shaped crystals of this salt make it more “pinchable” than table salt, making it easier to control exactly how much you use in a recipe.